Premiere Pro CC, the newest version of Adobe’s pro-level video-editing application, gets a slew of modest tweaks as it migrates to the cloud along with its fellow Creative Cloud suite mates. It’s not a ground-up overhaul, and it doesn't incorporate hot new technologies. But these tweaks indicate that Premiere Pro has taken on some of the characteristics of a cloud application, adding features as they are developed, rather than making customers wait for monolithic annual releases. Premiere Pro CC's interface is more stuffed than ever, but confining things to tabs helps manage it all. One of Premiere Pro CC’s new features is the addition of the Lumetri color engine from Adobe SpeedGrade, a sophisticated GPU-accelerated color-grading/correction application that debuted in Creative Suite 6. In Premiere Pro CC’s effects browser, you’ll see four sets of Lumetri "looks" (Cinematic, Desaturation, Style, and Temperature), and as with any video effect, you can drag a look onto a clip in the timeline, or onto an adjustment layer that covers multiple clips. If you never venture into SpeedGrade, then the Lumetri looks are just a few more effects added to the vast selection that Premiere Pro provides. But if you do use SpeedGrade, you can use that application to create and save new looks, which you can then import into Premiere Pro CC and apply over and over again, perhaps as part of implementing a consistent brand identity. However, the path to Lumetri is one-way—you cannot create or modify looks from within Premiere Pro. You must use SpeedGrade and then import into Premiere Pro. 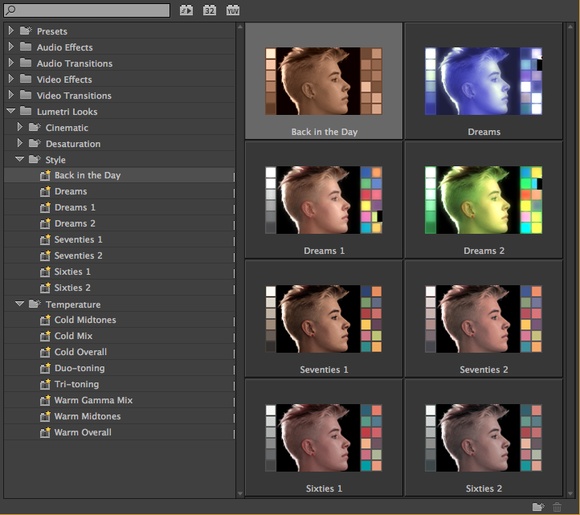 The new Lumetri "looks" are created in Adobe SpeedGrade and then pulled into Premiere Pro CC as effects. 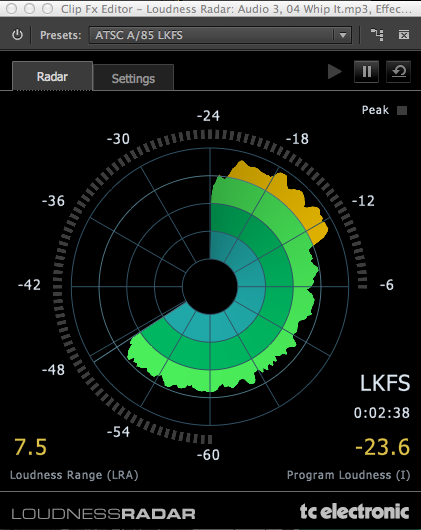 Another cool new toy, the Loudness Radar, will be very useful for broadcast TV thanks to the Commercial Advertisement Loudness Mitigation (CALM) Act, which mandates limits on differences in volume. If you enable the Loudness Radar and then play your timeline, the Loudness Radar will show you a visual representation of its loudness over time, with peaks and valleys on a circular graph. You can then use other controls to keep your volume within legally acceptable limits. Your used-car dealer clients may squawk, but, hey, that's the law. The Loudness Radar shows you a visual representation of your video's loudness over time. Here, I reduced the volume soon after starting it up, causing the yellow to disappear from the display. When you are editing video captured from multiple cameras rolling at once, cutting from one camera view to another throughout your sequence, getting the clips in sync can be difficult. 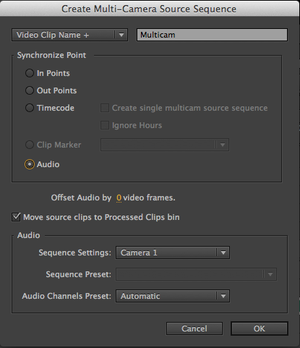 Now, Premiere Pro can synchronize the clips by analyzing audio from your source clips. How well it works depends on the audio type and quality. For example, if the cameras are placed far away from the subject, recording different audio, then this new method won't work. On some source footage using the traditional clapboard to register audio on multiple closely positioned cameras, it worked reliably with two clips, but not with three. It analyzes the clips quickly, though—within a few seconds—so even if it doesn't work, it isn't much effort wasted. 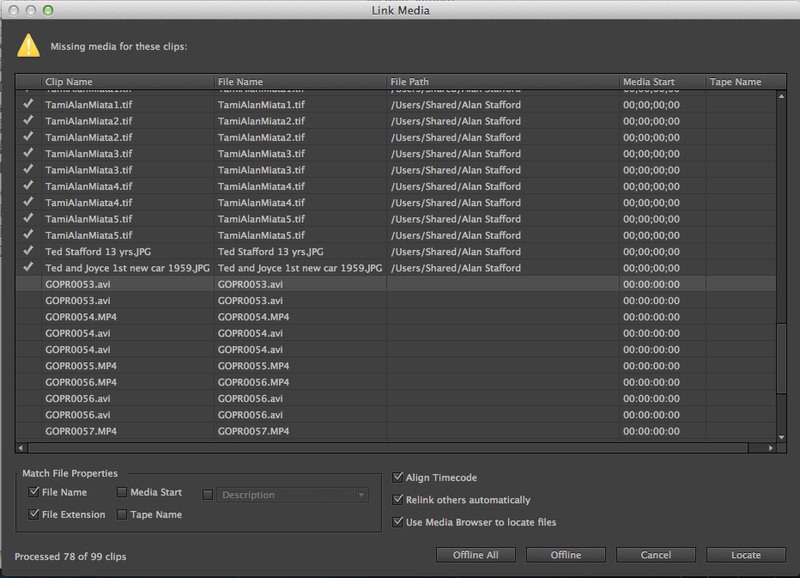 In past versions, if you moved files from one location to another, Premiere Pro would prompt you to locate the files. Now, however, when you attempt to locate files, Premiere Pro is much smarter about finding them, using metadata and its own search engine, rather than the operating system's, to do the job. You still have to click a Locate button, but you can either navigate to the folder where you think the files are, or you can use a Search button that works very quickly to scan an entire folder. When you've confirmed that the right file has been found, Premiere Pro will match up all the other assets in that same location. How would you like to locate all of these files manually? After you find the first one, Premiere Pro will link up all the other files in the same location. A useful shortcut in Premiere Pro has been that you can copy the attributes from one clip—its opacity, motion settings, effects—and paste those attributes to another clip in the timeline, en masse. 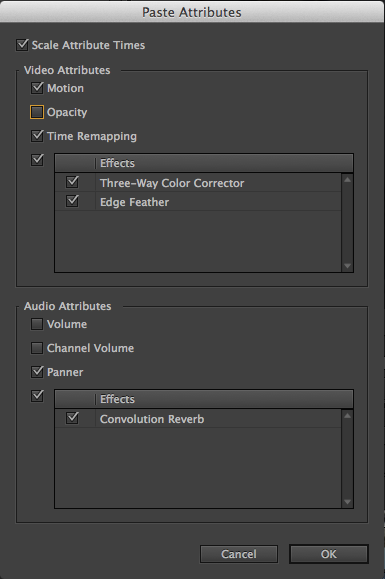 Premiere Pro CC lets you apply these attributes much more selectively, though; when you go to paste, a dialog box appears, allowing you to choose whether to apply opacity, motion settings, and time remapping (for video); volume, channel volume, and panning (for audio); and all or some effects. Premiere Pro CC gives you the option of pasting only certain attributes from one clip to one or more others. 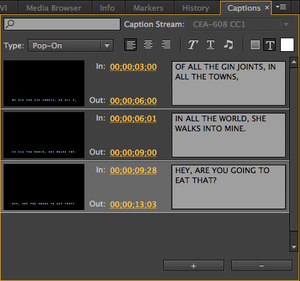 Premiere Pro CC greatly improves on the previous version's support for closed captioning. As with Premiere Pro CS6, you can import closed-caption files, but now you can import additional formats. And with the assistance of a new Captions window, you can edit them, too, or even create them from scratch. If you import QuickTime files with embedded captions, the captions will appear in the new Captions window. You place captions as a track in the timeline, but you can adjust the in-and-out points only in the Captions window. You can change captions' position and their color—even on different lines, to designate different speakers—but some caption formats do not allow changing text size. When you go to export your video file, you'll find a new Captions area. You can embed closed captions in a QuickTime file, but if you choose another video file format, you must export closed captions as a sidecar file, in one of four different export formats—Scenarist Closed Caption file (.scc), MacCaption (.mcc), W3C/SMPTE/EBU Timed Text (.xml), or an EBU N19 Subtitle file (.stl). YouTube, by the way, allows you to import any of these formats; other sites' support will vary, of course. 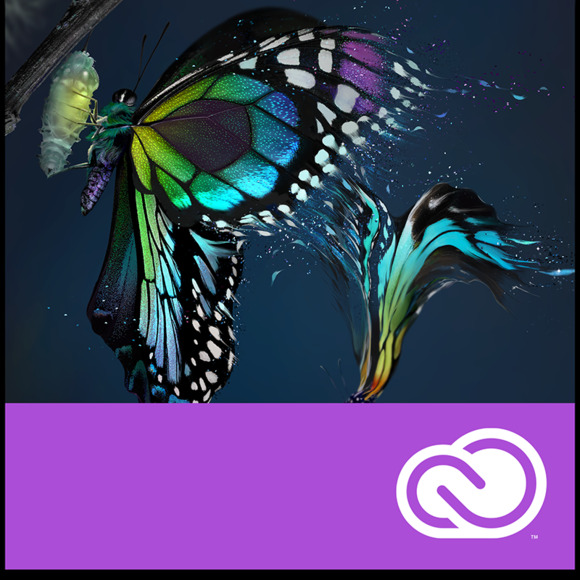 As with other Creative Cloud applications, your subscription allows you to install Premiere Pro CC on two machines, and you can sync your settings between them. However, Adobe says that the syncing system is separate from the licensing system, so you can log in on a system that has someone else's Creative Cloud subscription enabled and sync your settings on that system. It is still an installed application, rather than a cloud one, though, so you'll have to rely on the host system's resources. And as of now, Creative Cloud's Web fonts and files syncing isn't working yet. Premiere Pro CC also adds HiDPI support for Macs with Retina displays, and Adobe's list of graphics cards that are certified to support GPU acceleration has expanded. But more important, you can now enable GPU acceleration on a card that isn't on Adobe's certified-cards list, as long as the card has at least 1GB of onboard VRAM. In previous versions of Premiere Pro that offered GPU acceleration, you could do this yourself by hacking a text file, but Adobe now allows you to enable it from within the application. On a 2011 MacBook Pro with AMD Radeon HD 6750M graphics (certified by Adobe as supporting GPU acceleration), I exported a 1-minute movie overloaded with GPU-accelerated effects. With the GPU enabled, the MacBook completed the task in 22 minutes, and in 28 minutes with the GPU disabled. More powerful graphics cards, especially in desktops, will likely return a greater difference, but it's still free time you're getting back. A new feature lets you sync multiple clips by using their audio. Premiere Pro CC's Web-video production tools are still somewhat lacking, though. You can use it to export an H.264 file, which many browsers will play back natively, but you still cannot use it to export WebM or Ogg video, the other two HTML5-friendly Web video formats. That means you have three options for website videos: Find a third-party video conversion tool for those formats; embed Flash video; or embed video that's hosted on YouTube or another video-hosting site. Somebody needs to get the Dreamweaver CC product managers and the Premiere Pro CC product managers together in a room. With Premiere Pro CC, Adobe certainly checked several things off of the request list, and many of these enhancements are welcome additions. The closed-captioning capabilities and the loudness radar are quite useful, the improved file-location services work very well (if long overdue), and the Lumetri effects are very powerful (for those who use SpeedGrade CC). Nothing about Premiere Pro CC screams "gotta have it," but since it is now a cloud application, those tiny tweaks should be appearing frequently. 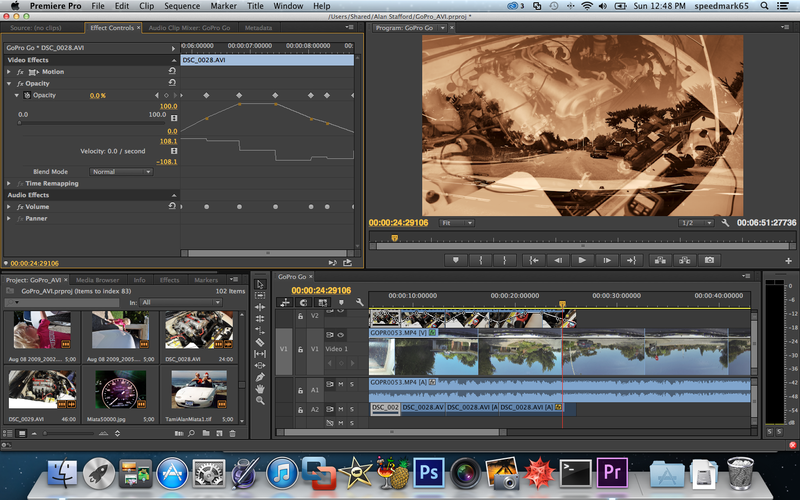 Several tweaks fine-tune this video editor, which gets a nice performance boost with the right graphics card.